In this lesson, you’ll be “juggling” two balls. Begin with a single ball in your right hand and a second ball in left hand. Keep in mind the basics of hand position to toss and catch the balls. You’ll have to read the following instructions first before you attempt the tossing pattern. As in the illustration, toss the ball in your right hand up in the air to about the level of your eyes. Try to make the ball arc towards your left hand. When ball number one is approximately at the peak of its arc, begin to toss the second ball in your left hand in a similar arc towards your right hand. After tossing the second ball, catch the first ball. In the end, catch the second ball with your right hand. Repeat and practice this pattern until you’re comfortable with it. Once your comfortable with starting with your right hand, you can now practice starting with your left. Juggling is one of the few skills where you must be equally skilled with both hands. As in the illustration, toss the ball in your left hand up in the air to about the level of your eyes. Try to make the ball arc towards your right hand. When ball number one is approximately at the peak of its arc, begin to toss the second ball in your right hand in a similar arc towards your left hand. And after tossing the second ball, catch the first ball. In the end, catch the second ball with your left hand. 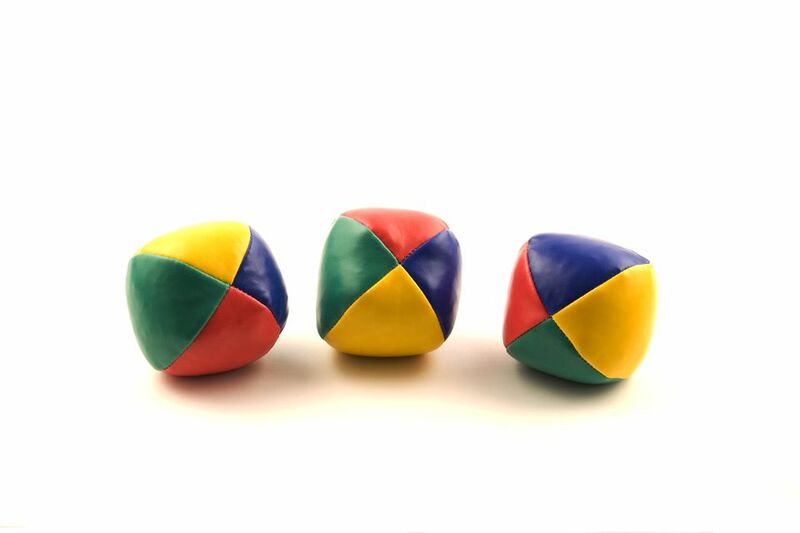 Before moving on to three balls in the basic cascade pattern, the foundational phase of true juggling, try to continually toss the two balls between your hands without stopping. When you can comfortably toss two balls in arcs from one hand to the other and not stop―effectively juggling two balls―you’re ready to move work with three balls.